BADMINTON Association of Malaysia (BAM) president Datuk Seri Norza Zakaria and National Sports Council director-general Datuk Ahmad Shapawi Ismail say the badminton system needs a major revamp if Malaysia is to regain its glory days. One of the suggestions is for players from the national sports school in Bukit Jalil and Bandar Penawar to be excluded from the Malaysia Games (Sukma). “Apart from (Datuk Lee) Chong Wei, all our single players have under-performed for over a decade,” said Norza, who is also Olympic Council of Malaysia president. “Only our doubles players have produced some semblance of success but they pale in comparison to the phenomenon that is Chong Wei. For the record, all the sports school players return to their respective states for Sukma. This means those back home may struggle to make the team or have a chance of winning medals. “Our development is flawed. I’m all for excluding the elite juniors from Sukma if this can help unearth more talented players,” said Shapawi. Meanwhile, on the subject of the Thomas Cup and Uber Cup teams’ failure in Bangkok last weekend, Norza said the coaches should shoulder some of the blame for not taking a risk when naming the squads. “If I didn’t push for the inclusion of several youngsters, we would have fielded the same old faces,” lamented Norza. “We had hoped to reach the semifinals in the Thomas Cup and quarterfinals of the Uber Cup despite the men being seeded seventh and women ninth. The sad truth, said Norza, is Malaysia has long fallen behind the other countries but no one wanted to point it out or make changes. “We won the first three tournaments (1949, 1952, 1955). Then there was a gap of 12 years before we regained the crown. “We have come close a couple of times but there have not been sustained challenges. “That is why I want to revamp our development programmes and have state academies in East Malaysia and in other zones throughout the peninsula. 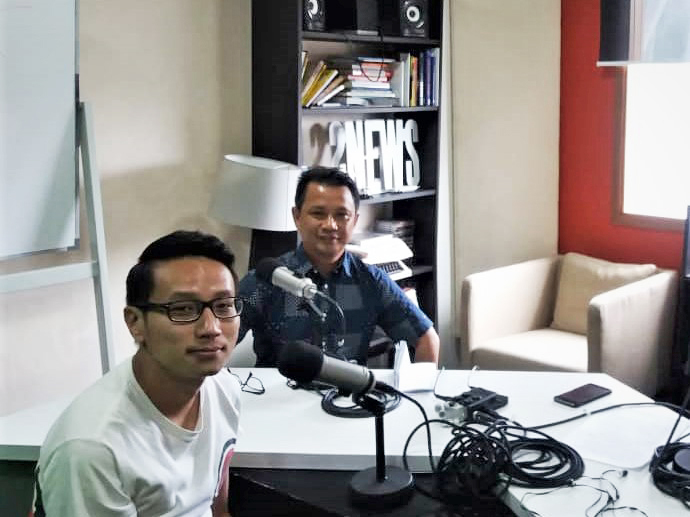 Norza, appearing on his first radio show, is joined by BFM producer Daryl Ong (left). To find out more about Norza’s plans, tune in to BFM 89.9 tomorrow at 10am. Journalist. Liverpool fan. Dreamer. Waiting for aliens to return. He can be reached at gnunis@twentytwo13.my or on Twitter (@gnunis1892). © 2019 Twentytwo13. All rights reserved.